This staircase ornament was inspired by my husband and one of his Christmas Family traditions. Christmas Eve, his father would have all of the kids stand on the stairs for a Christmas family photo. The ornament is made from resin with green glitter applied to the garland. It is available in a family of 3, 4, 5, or 6. 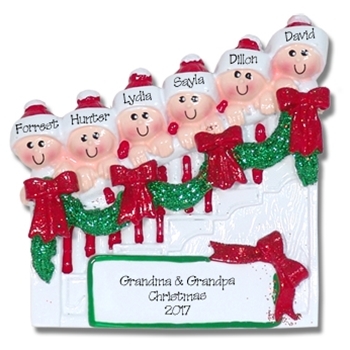 It would also work as a great ornament for grandparents with just the kids names on the hats. Made from resin and hand painted it is designed by me. Comes complete with hook and satin ribbon for hanging. May be personalized to your specifications absolutely FREE! Personalization is done by hand. The photo has been computer generated. Please leave very specific, exact personalization instructions at the bottom of your payment page and specify if year is to be included.